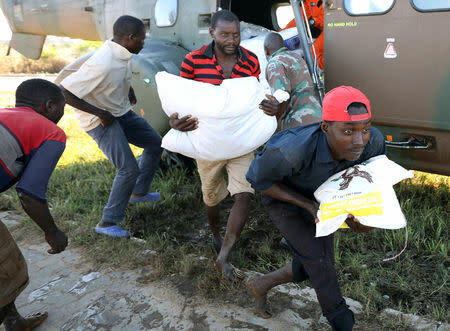 BEIRA, Mozambique (Reuters) - Rescue teams in Mozambique moved hundreds of people displaced by Cyclone Idai's massive and deadly flooding to safer shelters on Monday, while the government made preparations for a cholera outbreak that it says is inevitable amid the devastation. In areas west of the port city of Beira, hundreds of people were trapped for more than a week after Idai hit, surviving in vast tracts of submerged land with no access to clean water and shrinking food supplies. Water has been slowly receding and there was no rain in Beira on Monday, meaning some roads have become passable. But the size of the disaster zone means getting aid to the most needy is still difficult. "We are more organised now, after the chaos that we've had, so we're delivering food and shelter to more people today," Land and Environment Minister Celso Correia told reporters. The number of people in makeshift camps had risen by 18,000 to 128,000 since Sunday, he said, adding that the government would install a prevention and treatment centre for cholera in areas affected by the cyclone. "We have a lot of diarrhoea, but teams are working on the ground to say whether it is really cholera or not. But as I said there will be cholera," Correia said. In Buzi village, southwest of Beira, Reuters reporters saw hundreds of cyclone victims carrying their few possessions on their heads as they were moved to a displacement centre near the airport, where aid agencies have set up tents with access to drinking water. Idai lashed Beira with winds of up to 170 kph (105 mph) on March 14, then tore inland through Zimbabwe and Malawi, flattening buildings and killing at least 686 people across the three countries. United Nations aid chief Mark Lowcock said on Monday that the world body was appealing for $282 million to fund a response to the disaster in Mozambique for the next three months. This would cover relief including health, water and sanitation, he told reporters. "Mozambique is, we think, the worst hit, but there are very real needs in the other countries as well," said Lowcock, adding that appeals for Zimbabwe and Malawi would be launched in the coming days. The scale of the disaster has meant aid has been slow to arrive. Communities near Nhamatanda, around 100 km northwest of Beira, were due to receive assistance on Monday. On Sunday inhabitants of poor farming communities in that area told Reuters their food had run out and rescuers were yet to reach them. Aid workers distributed maize meal in the Chipinge district of eastern Zimbabwe, where there was no power or piped water. "We lost all our perishables after Cyclone Idai," Chipinge resident Kudakwashe Mapungwana said. "Since then we have no electricity at all and women are busy buying charcoal which is very expensive." Correia said the death toll in Mozambique remained roughly unchanged at 447 on Monday. Zimbabwe's Local Government Minister July Moyo told state radio that the storm had killed 179 people in Zimbabwe, up from a previous government estimate of 154, but that 329 people were still unaccounted for. In Malawi, the death toll from torrential rains and flooding, some of which occurred before the cyclone hit, had risen to 60 from 56, a spokesman at the Ministry of Homeland Security said. The government was sending relief items by train and truck, he said. The death toll in Mozambique could rise steeply as receding floodwaters allow rescuers to access remote areas or if waterborne diseases like cholera gain a foothold. The secretary general of the International Federation of Red Cross and Red Crescent Societies (IFRC) said after a visit to Mozambique that the situation there was a "ticking bomb" as regards waterborne diseases. Elhadj As Sy said: "I'm raising that alarm because so many of these waterborne diseases are a great risk but they are preventable."